Baller Alert: Is This the 2018 NBA Awards or the NBA Fashion Awards? 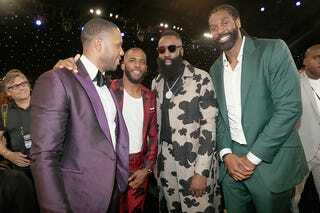 Eric Gordon, Chris Paul, James Harden and Nene attend the 2018 NBA Awards at Barkar Hangar on June 25, 2018, in Santa Monica, Calif. I don’t know much about sports, but what I do know is that NBA players have been getting really adventurous with their outfits lately. Case in point: At the 2018 NBA Awards on Monday, there were plenty of players in the building, but while many likely need to stick to their basketball careers, a lot of them looked like they were shooting their shot at a fashion career. James Harden attends the 2018 NBA Awards Show at Barker Hangar on June 25, 2018, in Santa Monica, Calif.
Chris Paul, also of the Houston Rockets, looked good in his red-and-black houndstooth-print suit—one of my fave looks of the night. Chris Paul attends the 2018 NBA Awards Show at Barker Hangar on June 25, 2018, in Santa Monica, Calif.
Shaquille O’Neal’s boring and boxy suit begged for a stylist, but his kids looked fly! Myles O’Neal, Shaquille O’Neal, Shareef O’Neal and Shaqir O’Neal attend the 2018 NBA Awards Show at Barker Hangar on June 25, 2018, in Santa Monica, Calif. Defensive Player of the Year Rudy Gobert speaks onstage at the 2018 NBA Awards at Barkar Hangar on June 25, 2018, in Santa Monica, Calif.
Victor Oladipo of the Indiana Pacers talks to the media during a press conference after winning Most Improved Player the NBA Awards Show on June 25, 2018, at the Barker Hangar in Santa Monica, Calif.
Chris Paul and Travis Scott attend the 2018 NBA Awards at Barkar Hangar on June 25, 2018, in Santa Monica, Calif.
Terrell Owens arrives at the NBA Awards Show 2018 at Barker Hangar on June 25, 2018, in Santa Monica, Calif.
DJ Khaled and 21 Savage attend the 2018 NBA Awards at Barkar Hangar on June 25, 2018, in Santa Monica, Calif.
Dikembe Mutombo and Joel Embiid attend the 2018 NBA Awards at Barkar Hangar on June 25, 2018, in Santa Monica, Calif.
Kyle Kuzma onstage at the 2018 NBA Awards at Barkar Hangar on June 25, 2018, in Santa Monica, Calif.
Georges Niang and Nick Young attend the 2018 NBA Awards at Barkar Hangar on June 25, 2018, in Santa Monica, Calif.
Sager Strong Award winner Dikembe Mutombo accepts his jacket from Yvonne Orji, Reggie Miller and Joel Embiid at the 2018 NBA Awards at Barkar Hangar on June 25, 2018, in Santa Monica, Calif.